Ef Regalado is a senior program manager on the Exchange engineering team, and Steve Chew is a senior product marketing manager on the Exchange technical marketing team. Ever pasted content from Word or a web page into a new email and found that you had to spend time fixing little formatting issues? How about trying to make changes to the layout of a table pasted from Excel? Outlook Web App features an enhanced text editor that is easy to use and provides many new capabilities. Both Office 365 and Exchange Server 2013 SP1 customers will benefit from this enhancement. Let’s take a closer look. When you compose a new message in Outlook Web App, it displays a paste menu that allows you to switch between different paste modes for your content. The new Outlook Web App paste menu. Sometimes you want to maintain the source formatting as closely as possible. Use Paste As Is (P) for a high fidelity rendering of the copied content from Office applications like Word or Excel. Or maybe you are more interested in the content than the format. Use Paste Simple HTML (C) to get rid of the font colors and sizes, while preserving the basic layout. This is great choice when pasting tables and bulleted lists from a busy web page. Finally, if you just want to paste the text, Paste Text (T) does exactly that. One of the other new features supported in the enhanced text editor is the ability to paste images directly from the clipboard. 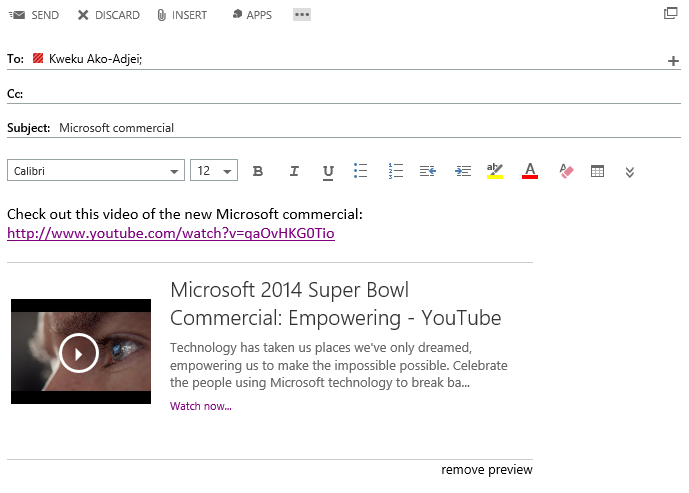 When you compose a new email message and type the URL for an external web page, Outlook Web App automatically generates a rich preview that lets you and your recipients take a peek into the contents of the site. This also works with YouTube videos. Rich hyperlink preview in Outlook Web App. There is a new Insert table button at the far extreme of the editor that lets you create new tables in Outlook Web App. Selecting the inserted table displays a menu which allows you to modify the layout by adding rows, deleting columns, merging cells, and more. This works even with tables pasted from other sources like PowerPoint or a web page. Inserting a row in a table in Outlook Web App. Outlook Web App also now supports adding, modifying and deleting alternative text for images. Alternative text, or alt text, is helpful in different scenarios, including reading messages on low speed connections and when using a screen reader. To access alt text, users selecting an image and then click the Alt text icon ( ) in the Format bar. The enhanced text editor in Outlook Web App is easy to use, provides more pasting options, creates rich previews to linked content, lets you create and modify tables, and supports alternative text for images. With it, you’ll spend less time formatting and more time communicating. Q. Is pasting images from the clipboard supported across all browsers? A. No, currently only Google Chrome supports pasting from the clipboard into Outlook Web App, other major browsers support coming at a later time. Q. Is rich hyperlink preview available for all Outlook Web App users? A. No, currently rich hyperlink previews are only available in Office 365.